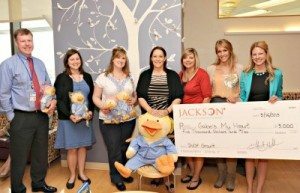 Nashville, Tenn. – Jackson National Life Insurance Company® in Denver, CO has provided a $5,000 grant to Gabe’s Chemo Duck Program®, a nonprofit organization providing comfort and companionship to children with cancer, to support the children being served at Children’s Hospital of Colorado. This grant money will provide more than 100 Chemo Ducks and other play therapy tools to current and future pediatric cancer patients at the hospital. Gabe’s Chemo Duck Program® is a program of the Nashville-based nonprofit organization, Gabe’s My Heart. Established in 2004 to provide education and comfort to children living with cancer through medical play using therapeutic tools, Gabe’s Chemo Duck Program has provided more than 20,000 ducks to children around the world. The goal of the program is to enable hospital staff and parents to prepare children for chemotherapy treatment and eliminate the fear of the unknown. Chemo Duck is a stuffed yellow duck dressed in blue hospital scrubs with a bandana around its head, a chemotherapy port on its chest and an immobilizer on his arm. In a gentle, age-appropriate manner, children learn what to expect during cancer treatment and have a friend to share the experience. In turn, children can use Chemo Duck to help friends, siblings and classmates to understand and empathize with their experience. In addition to providing Chemo Ducks, this comprehensive program has developed tools and resources for parents and caregivers, games and educational materials for children, tips for healthcare professionals, and much more. For more information, visit www.chemoduck.org. Children’s Hospital Colorado (Children’s Colorado) has defined and delivered pediatric health care excellence for more than 100 years. Founded in 1908, Children’s Colorado is a leading pediatric network entirely devoted to the health and well-being of children. Continually acknowledged as one of the nation’s top ten Best Children’s Hospitals by U.S. News & World Report and Parents magazine, Children’s Colorado is known for both its nationally and internationally recognized medical, research, education and advocacy programs, as well as comprehensive everyday care for kids throughout Colorado and surrounding states. Children’s Colorado also is recognized for excellence in nursing from the American Nurses Credentialing Centers and has been designated a Magnet® hospital since 2005. The hospital’s family-centered collaborative approach combines the nation’s top pediatric doctors, nurses and nurses and researchers to pioneer new approaches to pediatric medicine. With urgent, emergency and specialty care locations throughout Metro Denver and Southern Colorado, including its main campus on the Anschutz Medical Campus, Children’s Colorado provides a full spectrum of pediatric specialties. For more information, visit www.childrenscolorado.org and connect with Children’s Colorado on Facebook, Twitter and Pinterest.